Philippe Sereys de Rothschild unveiled the Mouton Cadet Limited Edition which was specially created for The 2018 Ryder Cup and fully symbolises this partnership. This exclusive Bordeaux wine was created by the American winemaker Chiara Mondavi, and the Frenchman Pierre Lambert, master winemaker of Mouton Cadet. Their collaboration echoes the long-standing shared history of the Mondavi and Rothschild families, built on mutual trust and prestigious wines. Together, they pay tribute to a legendary competition in which Europe and the United States face each other in a spirit of true sportsmanship. Vintage after vintage, 453 partner-winegrowers dedicate certain parcels of their vines to the excellence of Mouton Cadet. From among them, Chiara Mondavi and Pierre Lambert have selected 12 remarkable terroirs of the Bordeaux appellation, like the best 12 players in each Ryder Cup team. With its silky tannins, this rich and generous wine will offer not only golf lovers but lovers of great wine a truly exceptional tasting experience! 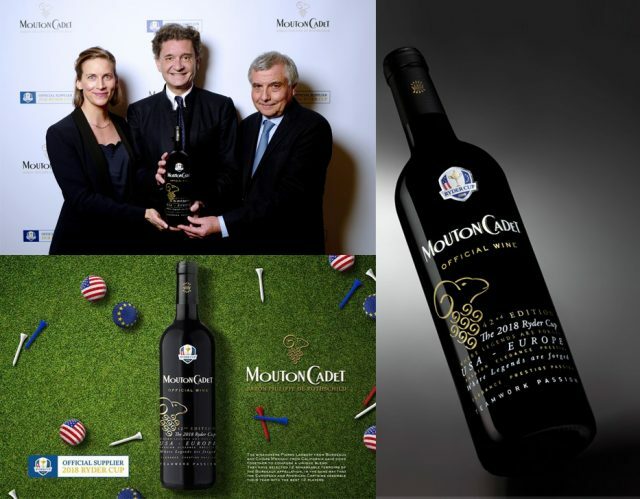 The Mouton Cadet Ryder Cup 2018 Limited Edition bottle features an innovative design, with a cloud of key words, highlighting the similarities which link the world of wine to the world of golf: respect, tradition, prestige, and teamwork.